Peach & Marigold from LAFTO smelled very elegant and the packaging… oh my goodness – so gorgeous!! The candle itself was housed in a thick and clear modern style vessel you’ll want to repurpose when you finish the candle, and the box it came in… so pretty!! The color of the box was teal with beautiful orange and pink flowers covering every portion of the box. I still can’t decide what I like best about luxury brands… the fragrances themselves or the presentation. Both I think, and LAFCO delivers both equally. Full disclosure, I wasn’t sure how I would like this fragrance since I’m not too keen on floral scents. But I admit once I smelled the wax, this fragrance intrigued me. First impression… I could clearly smell marigolds but I could also smell the sweet peaches, sugary nectar and subtle hints of sandalwood in the background. I couldn’t wait to light this candle to see how it performed. Because this is a floral scent, I decided to be daring and light this candle in my master bedroom. I wanted to really enjoy the aroma and was hoping the strength would be adequate to perform in such a large room. Once lit, it took around 15 minutes or so before I started noticing the fragrance and once it did…. 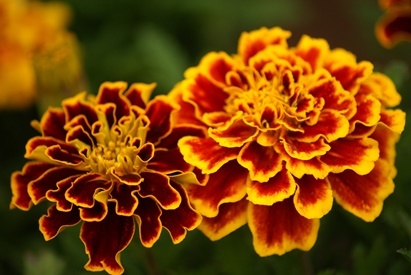 the sweet aroma of peaches and marigolds wafted all throughout my bedroom. Yes, this candle was strong and more than capable of filling a large room with fragrance. The overall scent…. very sultry and elegant. All elements in the scent description were present. First came the marigolds as the main component, then came peaches and nectar. The sandalwood was last and very subtle. The overall fragrance was really beautiful and elegant. I keep going back to that adjective – elegant. Somehow you just know. Strength – on a scale of 1 to 10, I would rate this candle an 8 in a large room. 10 in a medium and smaller rooms. This is a room filler and spectacular. My candle performed perfectly. Clean burn from beginning to end. No soot or wasted wax. Just remember to keep the wick trimmed before each lighting. 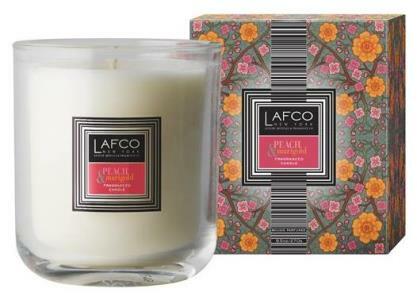 Peach & Marigold from LAFCO was a beautiful and sultry fragrance. I loved it and that’s coming from someone who doesn’t care for floral scents. Even my husband kept quiet with this one indicating it didn’t bother him. That’s the only time he comments – when he loves a scent or really dislikes it. When he’s quiet, I take that as a positive. If you love elegant fragrances, definitely try Peach & Marigold. It’s a keeper and worth pampering yourself with. I purchased this candle from Candles Off Main… my one stop shop for luxury brands.